Mummies could also be created naturally. The Incas did this when they mummified their dead by exposing them to the cold temperatures and dry climate. However, the most fascinating natural mummies were created after a human or animal died in some random place. A lucky combination of a perfect location, weather, and temperature as well as the absence of scavengers turned them into mummies. We have found some, and they are just amazing. 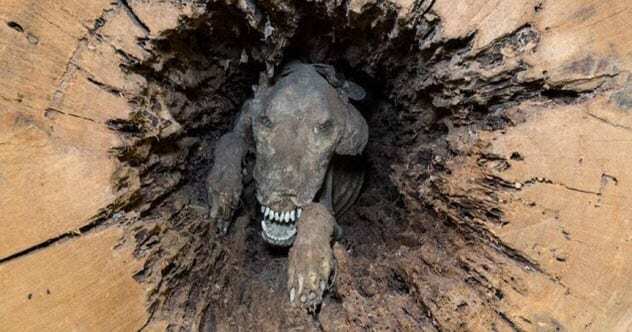 Stuckie is the mummified remains of a hunting dog that was trapped in a chestnut oak tree for almost 60 years. The dog was probably chasing a raccoon when it entered the tree through a hole around 1960. Unfortunately, the dog was too big to pass through the hollowed-out tree and got stuck. Eventually, it died of starvation. However, its body mummified instead of decaying. It remained untouched for about 60 years until it was discovered after some loggers cut the tree. Scientists later discovered that the moisture-absorbing tannin in the tree prevented Stuckie from decaying. The fact that the animal was stuck inside the tree also protected its body from scavengers. Stuckie is currently displayed at the Southern Forest World Museum in Waycross, Georgia. The dog’s remains are still inside the tree. In 2015, contractors searching for mammoth fossils around the Uyandina River in Siberia found the mummified remains of two cave lion cubs. These animals are the same size as the Siberian tiger—the world’s largest cat species. Cave lions roamed through Africa, Europe, and North America until they went extinct 12,000 years ago. Over 12,000 years ago, these cave lion cubs were 2–3 weeks old when the soil around their den collapsed and buried them inside. Cave lions are born blind, and researchers believe that the mummified cubs had never opened their eyes at the time of death. The ice of Siberia mummified their remains, leaving them well-preserved. Even their eyes were intact, making them the most complete cave lion fossils we have ever found. Before their discovery, fossil bones were all we had to prove that cave lions had ever existed. The fossils were named Uyan and Dina after the Uyandina River where they were found. Ancient Egyptians are famous for their pharaohs, pyramids, and mummies. We all know they mummified lots of humans and cats. However, a lot of people do not know that they also mummified several other animals, including baboons, crocodiles, dogs, birds, and lions. Mummified lions are the most surprising. We already know that lions were revered in ancient Egypt. The ancient Egyptian god Nefertum is depicted as a lion. The goddess Sekhmet also has a lion head. Ancient Egyptian writings indicate that this civilization kept lions and could have mummified the animals after their deaths. A group of archaeologists led by Alain Zivie revealed that tales of the mummified lions were true after the scientists found the first mummified remains of a lion among those of several cats at Saqqara cemetery in Egypt. Analysis revealed that the lion was a pet that had lived and died in captivity. A few years ago, researchers from the University of Manchester and Manchester Museum scanned 800 animal mummies from ancient Egypt. To their surprise, they discovered that a third of the mummies had no animal remains in them. Another third had partial animal remains, and the last third contained full animals. This probably occurred because animals were often mummified to be offered as sacrifices to Egyptian deities. In comparison, human mummies were created to preserve the bodies for their spiritual journeys into the afterlife. Researchers believe that ancient Egyptians specifically bred animals to turn into mummies. They were often unable to keep up during periods of high demand, causing them to sometimes cut corners. And how best to cut corners if not by excluding the animal from the mummy? While some researchers believe that sellers passed the fake mummies off as the real thing, others believe that vendors replaced the animals with items used by the animals, which was supposedly ethical. Examples include putting a nest or eggshell in place of a bird. However, no one knows for sure. Until a few years ago, Batagaika crater in eastern Siberia harbored the mummified remains of a young Lena horse (Equus caballus lenensis). The now-extinct Lena horse lived in eastern Siberia 30,000–40,000 years ago. This foal is believed to have lived around the same time. Researchers believe that the foal died by drowning after a fall into a natural trap. The animal was just two months old at the time of death. Fortunately for us, its remains were perfectly mummified in the icy permafrost of Siberia. The foal was found with its skin, tail, hooves, and nose hairs intact. Lake Natron is one of the weirdest lakes you will ever read about. Located in Tanzania, the lake has a higher-than-normal alkaline level, making it highly caustic and deadly. Animals that fall into it die and become calcified. Only some flamingos, the Alcolapia latilabris (a species of small fish), and algae can survive the lake’s harsh properties. Mummified remains of eagles, doves, swallows, songbirds, and even bats have been recovered from the lake. Flying animals are often victims because the lake reflects like a mirror when viewed from above. Many unfortunate birds and even a helicopter pilot unwittingly ended up in the lake after mistaking it for empty space. Lake Natron is named after natron, a chemical formed from a mixture of sodium carbonate and baking soda. This is the same reason that the water has a high alkaline content and turns birds into mummies. Natron itself has been used by humans for millennia. Ancient Egyptians used it as far back as the 4th millennium BC to make glass and preserve their mummies. In 2011, some tribesmen in Siberia found the mummified remains of a bison along a lake. Researchers determined that it belonged to the now-extinct steppe bison (Bison priscus), an ancestor of the modern American and European bison. However, researchers named the fossil after the Yukagir tribe that found it. The Yukagir bison was found in almost perfect condition, which is really incredible considering that it died about 9,000 years ago. In fact, it is the most perfect steppe bison fossil ever found. It had its fur and most of its internal organs intact—including the heart, lungs, stomach, blood vessels, and brain—even though they had shrunk in size. Researchers later removed several of these body parts for analysis. They determined that the bison was around four years old at the time of death. It probably died of starvation because there were no layers of fat in its abdomen. The fossil of Yuka the mammoth takes the top spot among the mammoth fossils we have discovered. This is because Yuka’s internal organs are well-preserved even though she has been dead for 39,000 years. Her brain, tissues, and muscles are all intact. In fact, scientists are trying to use her tissues and DNA to clone the woolly mammoth. The intact brain is the most fascinating. Researchers have never found a mammoth brain even though they have discovered lots of mammoth fossils. Interestingly, researchers never expected to find a brain. They saw it by chance during a MRI scan to detect Yuka’s age. Yuka was found in Russia’s Arctic Circle in 2010. She weighs over 100 kilograms (220 lb), causing researchers to speculate that she was 6–11 years old at the time of death. The analysis of injuries, including bite and scar marks, on her body reveal that she was attacked by a cave lion trying to feed on her. Some humans watched the hunt. The cave lion scored the kill, and the humans probably attempted to steal it. However, it is obvious that none of the parties succeeded. In 2016, some Canadian miners found the 50,000-year-old mummified remains of the only ice age wolf we have ever found. The pup was discovered as the permafrost melted around the Klondike region of Yukon, Canada. Interestingly, the pup was perfectly preserved with its head, tail, skin, hair, and other body parts intact. A nearby caribou calf was not perfectly preserved and was missing several vital body parts from the stomach down. Only the head, torso, and two front legs were intact. Scientists determined that the pup and caribou calf died around the same time. Scientists hope to extract the pup’s DNA to provide insight into the ice age wolf population. In 2016, researchers recently got their hands on the 12,400-year-old mummified remains of a puppy from the Pleistocene epoch. The fossil was found frozen in the permafrost at the bank of the River Syalakh in Siberia. Researchers believe that the puppy died in a landslide after which its body mummified in the ice. Curiously, the mummified fossil of the puppy was well-preserved. Its entire body, from its nose to its tail, was intact. Even its hair was unscathed. The brain had partly decomposed, though. However, 70–80 percent of it was intact, which is impressive considering how long the puppy has been dead. To put that into perspective, the partly decomposed brain of the 12,400-year-old puppy is the only brain we have from an animal from the Pleistocene epoch even though the puppy is not the only animal or dog we have from that time period. Earlier in 2011, researchers had found the fossil of another dog around the area. Unfortunately, that animal was too decomposed to be useful. Scientists believe that both dogs are related. Researchers also uncovered human tools around the site. They believe that the tools belonged to the humans who owned the animals. This indicates that they were domestic animals. This is why scientists concluded that they were dogs and not wolves. Nevertheless, researchers believe that the valuable DNA and tissue extracted from the 12,400-year-old puppy could be used to bring it back to life.